Environmental literacy and education is not simply a top-down process of disseminating correct attitudes, values and beliefs. Rather, it is one that incorporates and facilitates a dialogue with audiences of different persuasions and at all levels of engagement, to help highlight and co-produce consensual solutions to the major eco-challenges of our time. 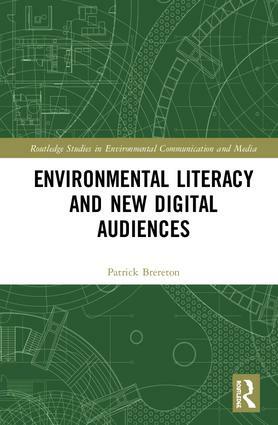 Exploring the growing power and influence of media formats and outlets like YouTube and gaming, alongside fictional and documentary film, this book considers new modes of environmental literacy to ascertain the effectiveness of digital and filmic stimuli on an audience’s perception of environmental issues, and its specific impact on environmental action. Drawing on extensive research across a broad range of media formats, Brereton establishes how environmental narratives and meanings are created and being received by contemporary audiences. This book will be of great interest to students and scholars of environmental communication and media, eco-criticism and environmental humanities more broadly. Pat Brereton is a Professor at Dublin City University, Ireland, and has taught and published extensively around environmental communications and all forms of new media.